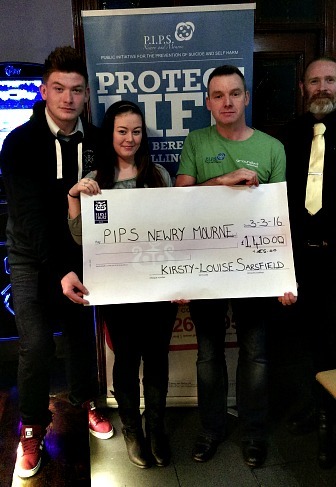 On Friday 19th February Kirsty-Louise Sarsfield held a Fundraiser in Memory of her Mum Sharon Sarsfield. The event took place at No.7 Warrenpoint and raised an amazing total of £1410.00. Kirsty-Louise would like to thank everyone who donated and supported her in any way and PIPS Newry & Mourne would like to express sincere thanks to Kirsty-Lousie for her time and effort in organisesing this event. Pictured L-R Aidan Sarsfield, Kirsty-Louise Sarsfield, Eamon Murphy PIPS Newry & Mourne and Kieran Rice of No.7 Duke Street Warrenpoint.